Making forecasts is foolish, but it is my belief that one must have a view on both the economy and on what the market expects of the economy in order to invest with confidence. For example, taking on risk when the market is risk averse is potentially more rewarding than taking on risks when the market demands a high price for it. So that readers may judge how successful (or unsuccessful) I've been in this regard, it has been my custom for a number of years to annually review the success or failure of prior predictions while at the same time offering up predictions for the future. Mostly right: I thought the economy would improve somewhat on the margin, even though the recovery would remain sub-par. The economy didn't pick up much if at all, unfortunately. However, confidence is beginning to return as investors weigh the prospects for significant growth-oriented fiscal policy reform in coming years and as energy prices plumb new lows. Wrong: I worried that the Fed would be slow to tighten, and that inflation would consequently exceed expectations. I've been wrong on this score since 2009, since inflation remains firmly in check. I consider this a fortunate mistake. Mixed bag: I thought sharply lower oil prices would liberate a lot of economic activity, boosting growth prospects. While there's some evidence that cheaper energy has been a positive (rising consumer confidence, increased vehicle miles travelled, higher real yields), the energy-producing sector of the economy has suffered significantly, and the shock has had a dampening effect on the larger economy. In short, I underestimated the extent to which oil prices would fall and how damaging the shock of lower oil prices would be to energy-producing sectors. Mostly right: I thought cash would be an unattractive investment relative to just about everything else, with the notable exceptions of commodities and gold. Equities have managed to generate a modestly positive total return for the year, but corporate bonds have suffered sizable losses, particularly in the high-yield energy sector. Commodities and gold have turned in yet another miserable year, but real estate has done very well, particularly of the commercial variety. Right: I thought a recession was quite unlikely, and the danger of deflation was exaggerated. Although growth has been far from impressive, the economy has nevertheless managed to grow by at least 2% this year with no signs of emerging weakness. Although headline measures of inflation have been hugging zero, core inflation has been running a solid 1.5-2% for many years and continues to do so. Mostly right: I thought profits growth would continue to slow, and gains in equities would come mainly from an expansion of multiples. As it turns out, corporate profits actually declined a bit, but PE ratios have risen, and have accounted for the bulk of this year's net gains. Right: I thought the dollar would continue to strengthen, since the U.S. economy was likely to exceed relatively dismal expectations. As of today, the dollar is up almost 10% against other major currencies. 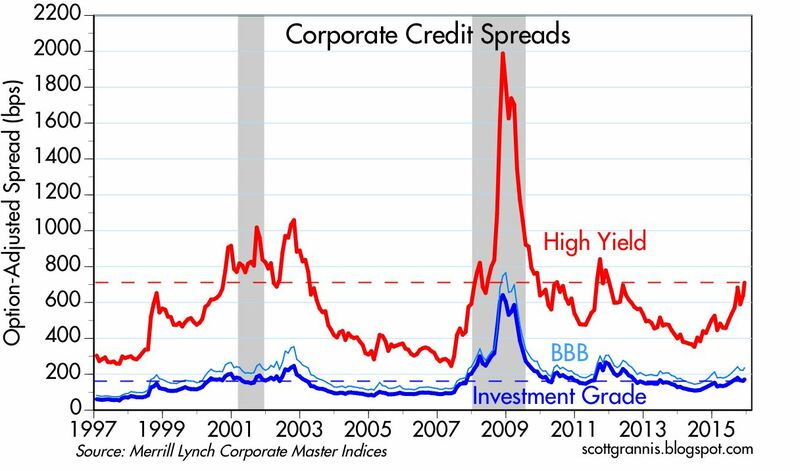 I remain generally optimistic, mainly because I think the market is still dominated by risk aversion and caution (e.g., corporate profits relative to GDP are significantly above average, but PE ratios are only marginally above average, and interest rates are still historically low). But it's an optimism tempered with caution. I think the economy can do better than expectations (which are quite modest) even though growth is likely to be disappointingly slow from a longer-term historical perspective, much as it has been for the past six years. I like the fact that the economy still has a considerable amount of untapped potential which could be unleashed with a shift to more growth-oriented fiscal policies. I'm also comforted by the fact that financial markets are highly liquid, systemic risk appears to be very low, and the yield curve is positively sloped (i.e., swap spreads are very low and monetary policy is accommodative). In short, the market is still rather cautious, and expectations for the future are not very optimistic, and that's a low bar to clear. I know that many argue that risk assets are wildly over-priced because of easy money, but I'm not a buyer of that view. Interest rates are low and inflation is low—despite an abundance of money—because the demand for money and money equivalents is still very strong. The Fed has not artificially depressed interest rates, it has instead responded to very strong money demand by increasing the supply of money. 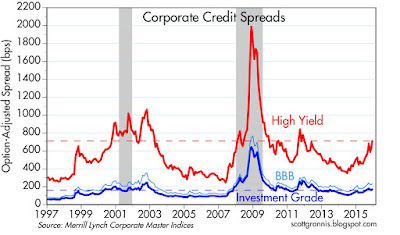 The only way to understand why inflation remains low when cash yields almost zero and equities have an earnings yield of more than 5% is to realize that the market deeply distrusts the ability of corporate profits to sustain current levels. The Fed is finally in "tightening" mode, but is unlikely to move aggressively, at least for the near term, and that is fully priced into the term structure of yields. Nevertheless, the key variable to watch is confidence. 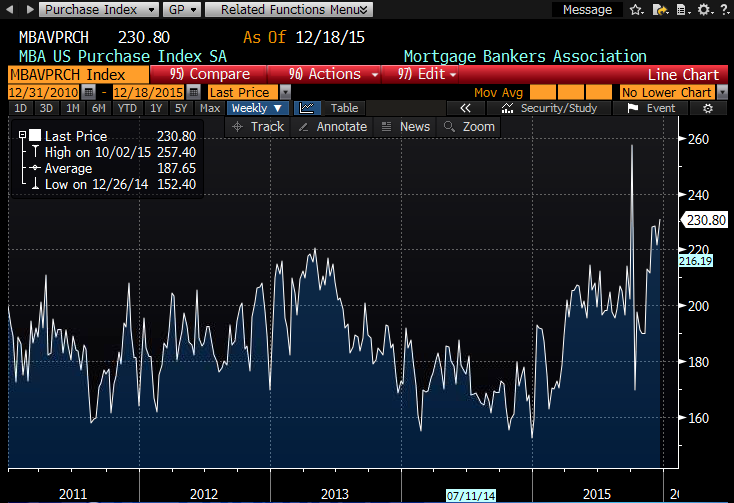 Since 2008, confidence has been lacking and the demand for money has consequently been very strong. The Fed was right to engage in QE, because if they hadn't supplied all the money the market demanded, then we would have had deflation and perhaps another recession. 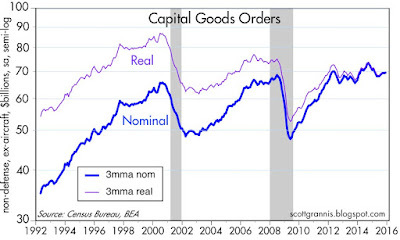 But if and when confidence returns with a vengeance, then the demand for money and money equivalents (of which there is a virtual mountain) could decline faster than the Fed's willingness and ability to offset this by raising short-term interest rates. In short, a substantial improvement in the economic outlook could result in the Fed raising rates too little, too late. And that, of course, would result in a significant oversupply of money, which in turn could fuel an unexpected rise in inflation and higher bond yields. I've been wrong on this score for years, but that is no reason to discount the risk of this happening over the next several years. I also worry that neither of the current frontrunners—Trump and Clinton—have a good understanding of what ails the economy (e.g., too much government spending, burdensome regulations, high marginal tax rates, particularly on corporate profits, and an impossibly complex tax code). The policies Clinton is advocating would only exacerbate the problems that already exist (more subsidies, higher marginal tax rates, more spending, more regulations). At the same time, too many of the policies that Trump advocates are populist in nature (protectionist, xenophobic, authoritarian) and therefore anti-growth. There's still plenty of time for policy advocacy to change for the better, but until the debate focuses on more pro-growth policies, I doubt that the economy will do much better than 2-3% growth. In short, I see more of the same slow progress as we saw this year, but with substantial upside potential lurking in the background. For the time being, this puts a premium on investments that offer more attractive yields than cash (e.g., dividend-paying equities, corporate bonds, and commercial real estate), and it spells more trouble for gold and commodities. I think the odds favor a somewhat stronger dollar, for the same reason as they favor equity investments relative to cash; the U.S. economy still has the potential to surprise on the upside, and there are no immediate reasons to expect economic conditions to deteriorate. Given the thrashing that emerging markets have endured for the past few years—thanks to a stronger dollar, a better-than-expected U.S. economy, falling commodity prices, and the inevitable unravelling of leftist and statist policies in many of these economies (e.g., Brazil, Argentina, Venezuela, Chile), the coming year is likely to see the beginnings of a long-awaited and much-needed recovery. I note the recent, impressive victory of Macri in Argentina and his rapid implementation of strong, pro-business and pro-growth policies. Argentina looks to be the bellwether for the region, leading the way for similar reforms in Brazil, Venezuela, and Mexico, and even in the U.S. It's not too much to hope for, and it's about time. 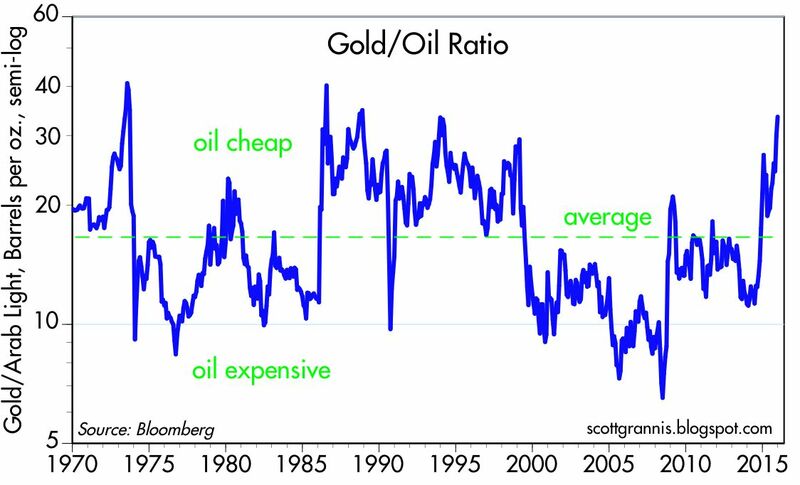 Over the past 5 years or so, the price of oil has tumbled by two-thirds, gold is down over 40%, non-energy commodity prices are down 40%, and industrial commodity prices have fallen by one-third. Over the same period, Chinese economic growth has slowed from 12% to less than 7%, most industrialized economies have experienced persistently weak growth, and inflation has been relatively low and curiously resistant to central banks' efforts to boost it. Many have looked at these facts and have concluded that the world is caught up in a deflationary death spiral. 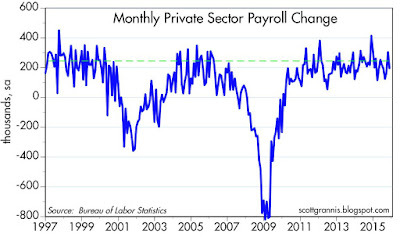 Bearish fever is alive and well, but it is countered by evidence that the economy continues to grow. 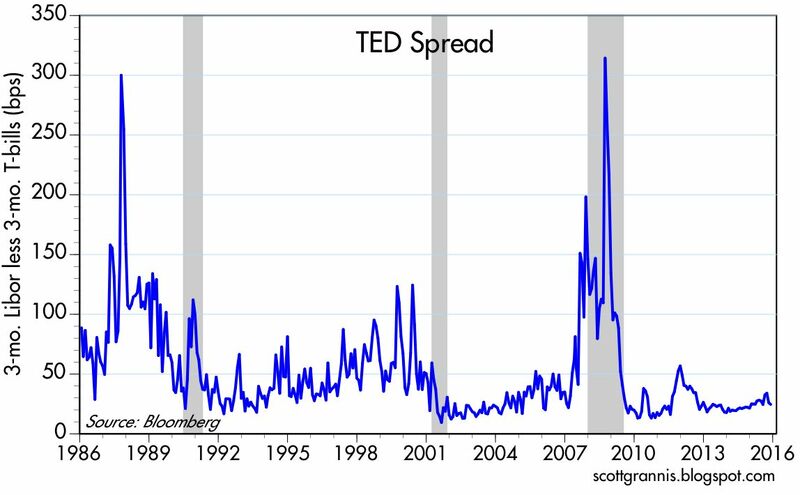 As I've said many times before, when sentiment is braced for deflation and recession, all that matters is avoiding recession. This line of inquiry isn't very exciting, however, and that's one reason blogging on this site has been light of late. Nothing much has changed: the economy shows every sign of continuing to grow at a relatively disappointingly slow pace. The important thing nevertheless is that there is no sign of recession, deterioration, or deflation, and that's good news. If ever it made sense to pay more attention to core inflation rather than headline inflation, it's now, given the magnitude of the collapse of oil prices over the past year or so. Headline inflation has been hugging zero for most of the past year, but core inflation has been averaging 1.6 - 2.0% for the past 10 years. In the 12 months ended November, PCE Core inflation was 1.33%, while CPI Core inflation was 2.02%. 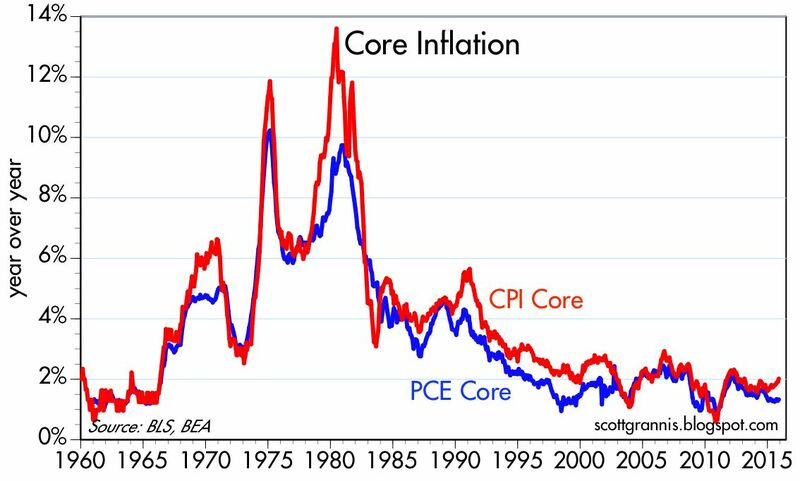 As the chart above shows, these two measures of inflation closely track each other over time, with the PCE Core tending to be about 40-50 bps lower than the CPI. The message here is that inflation has been relatively low and stable for a long time, with not even a hint of deflation in recent years or months. The fact that the Core PCE deflator measure of inflation is somewhat lower than the Fed's current 2% target is not troubling in the least, in my opinion. 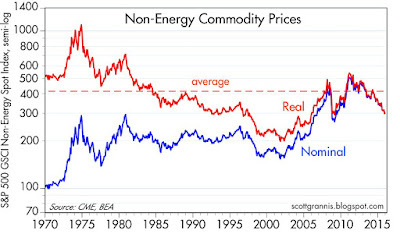 The chart above focuses on non-energy commodity prices, in both real and nominal terms. 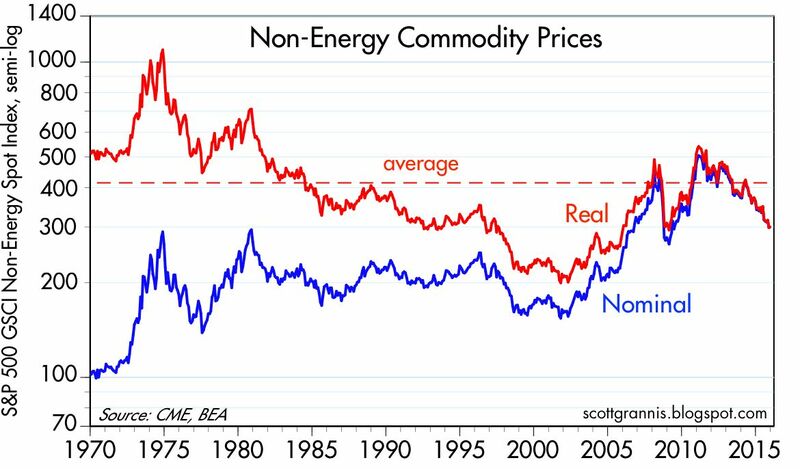 In real terms, non-energy commodity prices today are about 27% below their long-term average, but 50% above their all-time lows of late 2001. Commodity prices have fluctuated significantly over the past several decades, and their recent "plunge" is hardly unprecedented. In nominal terms, commodity prices today are still double what they were in late 2001. Message: business as usual. Plus, the recent downturn in commodity prices likely has much more to do with increased supplies than with any deflationary error on the part of the Fed. As such, lower commodity prices are good news for commodity consumers, since they free up money for other expenditures. The commodity markets may be struggling, but the bond market is more sanguine. Real yields on 5-yr TIPS—arguably a good proxy for the market's perception of the economy's underlying growth potential—have risen from a low of -1.8% in early 2013 to almost 0.5% today. 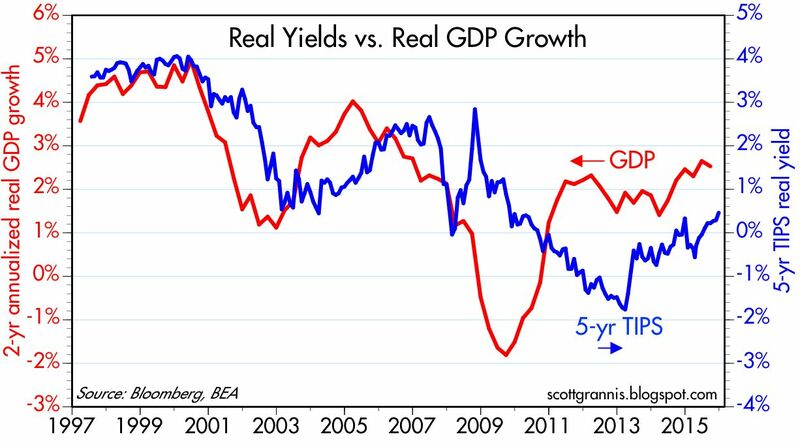 I note that this increase in real yields has tended to track an improvement in the economy's growth rate over the same period. Growth expectations are still modest, but they are improving on the margin, and not deteriorating. 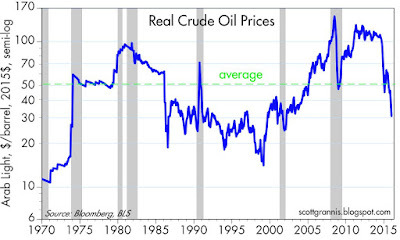 As for oil prices, in real terms (see chart above) they are only about 30% below their long term average. In real terms, oil prices today are about the same order of magnitude as they were in the 80s and 90s, when the economy enjoyed generally robust growth. Thank goodness for a return to relatively cheap energy. As the chart above shows, when we compare oil to gold, oil looks very cheap today. It's rarely been this cheap compared to gold. 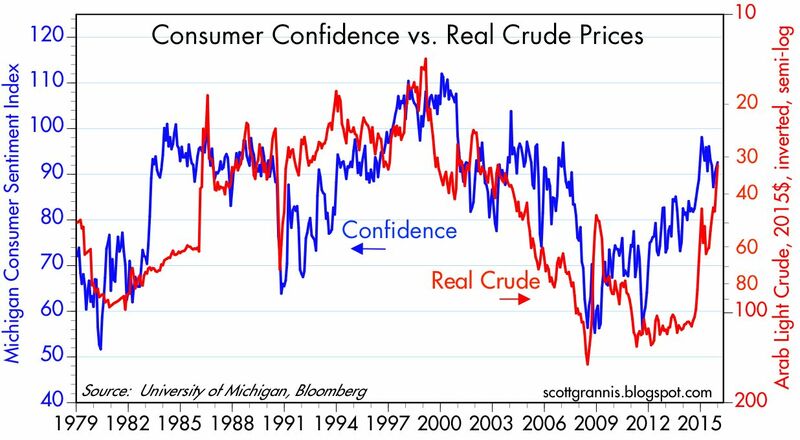 The chart above compares the real price of oil (inverted) to a measure of consumer confidence. 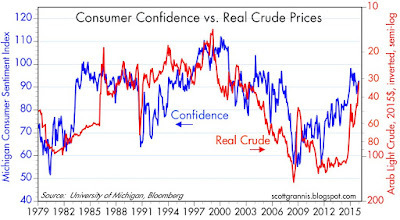 Cheaper oil in the past year has helped boost consumer confidence considerably. 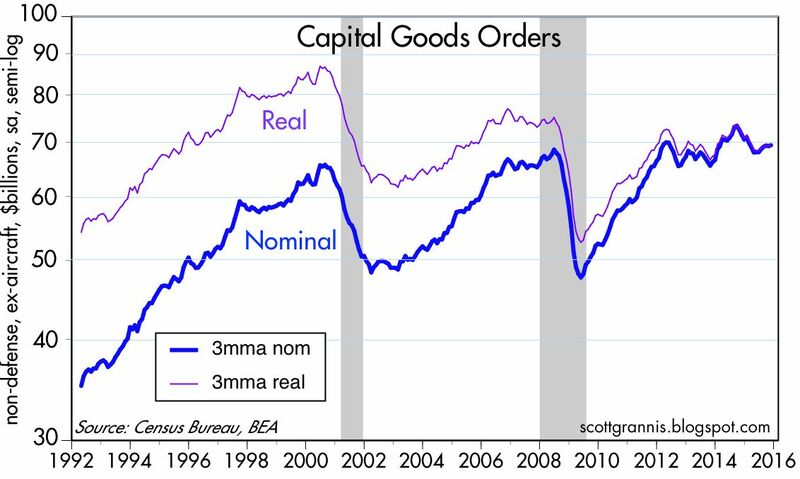 November capital goods orders confirmed that business investment remains lackluster, and this is a good reason why the economy continues to grow at a sluggish pace. But while the news was not optimistic, neither did it show any sign of deterioration. That's the important news. 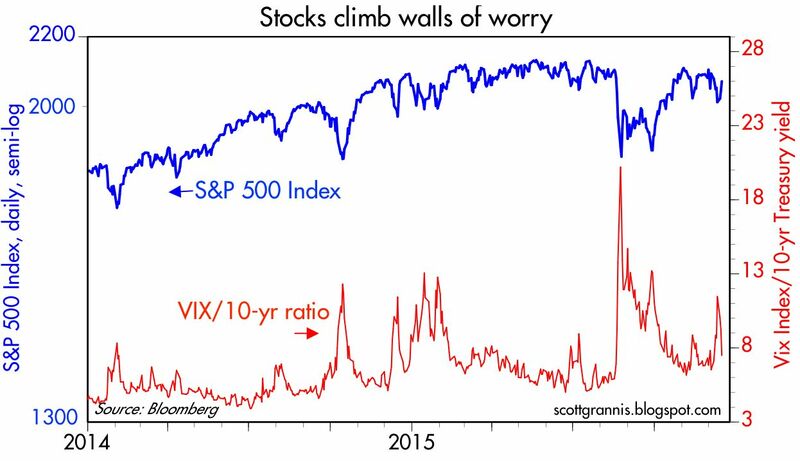 And so the market continues to climb walls of worry. Worries abound (e.g., deflation, commodity collapse, Fed tightening, China weakness), but they amount to nothing: the economy keeps growing at a modest pace. Stocks are reasonably priced, and absent a deterioration in the outlook, are attractive, if only because earnings yields are significantly higher than the yield on cash. Markets today welcomed the Fed's decision to raise short-term interest rates. It's hard to imagine how this tiny move could prove troublesome, but it's not hard to see why the market cheered. At the very least it removes the uncertainty that had surrounded the Fed's ZIRP for many years. It also sends a positive message, since it's the Fed's way of saying they have more confidence in the economy's ability to continue growing. 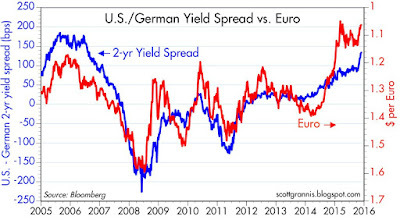 On the margin it makes saving more attractive, and borrowing a bit less cheap (real borrowing costs have been generally low and now they're a bit less low), and there's nothing wrong with that A modest rate hike is supportive of the dollar, and a strong dollar is always preferable to a weak dollar, since it attracts capital and capital is what powers productivity. 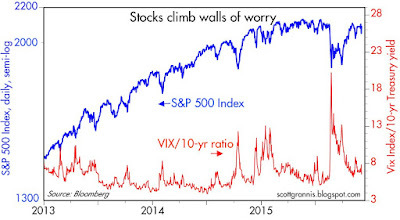 The chart above shows the equity market's sensitivity to fear, uncertainty and doubt (as proxied by the ratio of the Vix to the 10-yr Treasury yield). Uncertainty has dropped meaningfully with today's Fed announcement, and that has bolstered the prices of risky assets, as it should. The prices of gold and 5-yr TIPS (using the inverse of their real yield as a proxy for their price) continue their multi-year downtrend. 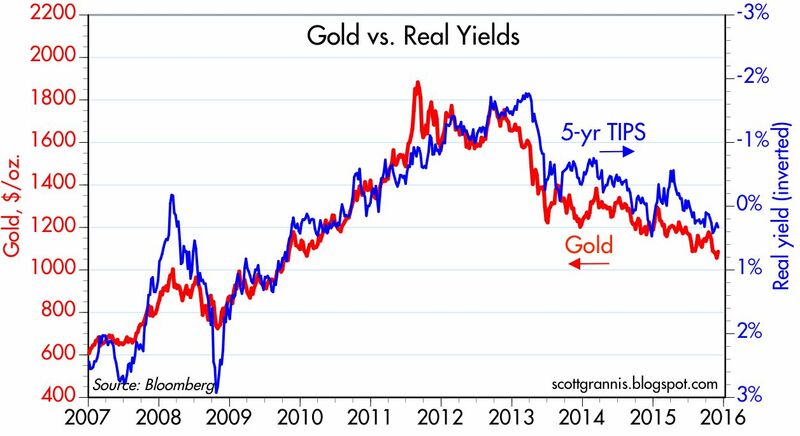 I've featured this chart for years, arguing that it shows that the market is gradually becoming less risk averse (gold and TIPS are classic safe havens). 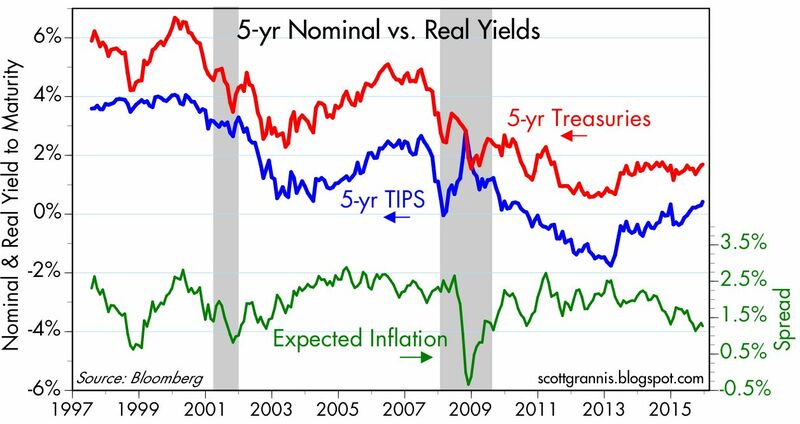 Rising real yields on TIPS are also a sign that the market is becoming more confident in the ability of the economy to grow. The market is still quite cautious (on average the real yield on 5-yr TIPS tend to be about one percentage point less than real growth, but as of today it is about two percentage points less), but on the margin becoming less so. So, a bit of good news as we enter the holiday season. The collapse of crude oil prices since mid-2014 has not only devastated the oil industry, it has also sowed confusion over the issue of inflation. Since crude prices started falling in the summer of 2014, headline inflation fell from 2% to essentially zero for most of this year. Yet if we exclude energy from the calculation, inflation has been fairly steady at 2% for a long time. This bears repeating: if not for the big decline in oil prices in the past 18 months, the underlying trend of inflation at the consumer level would have been 2% for the past 13 years. 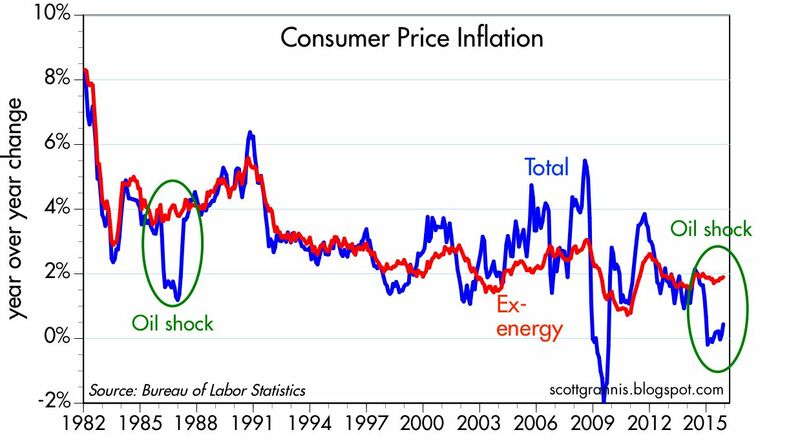 Energy prices are not going to fall forever; once they simply stabilize, then headline inflation should bounce back to 2% fairly quickly. The Fed understands this, but—arguably—markets do not, since key measures of inflation expectations over the next 10 years range from 1.25% to 1.8%, and those expectations assume that oil prices will decline substantially further in the next year or so. We need to keep in mind that the active drilling rig count in the U.S. has declined by two-thirds in the past year (i.e., future oil supplies are going to be expanding at a far slower rate), while vehicle miles driven in the past year are up over 4% after being flat for the previous six years (i.e., the demand for oil is rising meaningfully, thanks to lower prices). Markets are adjusting rapidly to lower oil prices, so today's oil glut could easily disappear within a year or less. 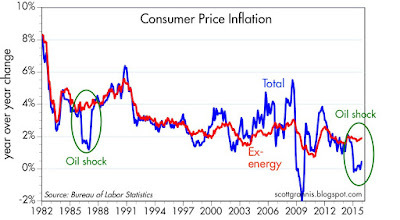 As a result of the shock of sharply declining oil prices in 1986, the CPI fell from 3.9% in early 1986 to 1.2% by the end of 1986, while the CPI ex-energy remained around 4% throughout. Six months after oil prices stopped falling, the CPI had returned to 4%. 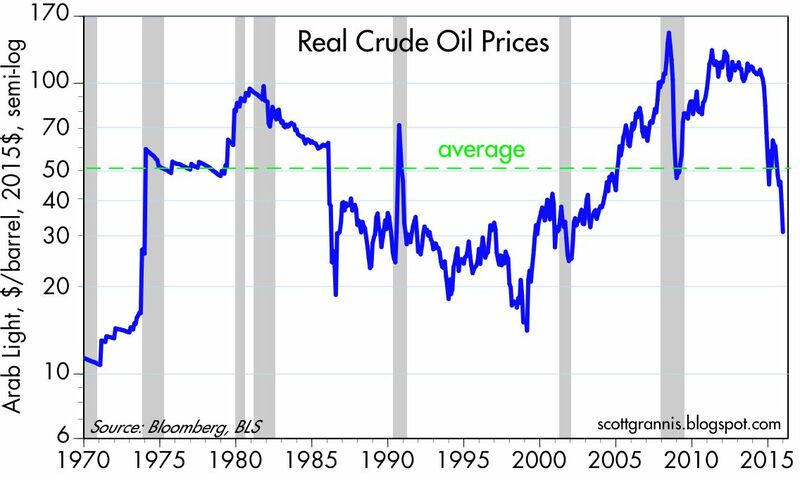 The chart above gives you a feel for just how much energy prices have contributed to the volatility of consumer price inflation, and it highlights the 1986 oil shock and the current oil shock. There is every reason to believe the current episode will play out in a similar fashion to the 1986-1987 episode. Once oil prices stop declining, the headline CPI will probably return to the underlying rate of non-energy inflation (2%), most likely by the middle of next year. The chart above shows the level of the CPI ex-energy, plotted on a log scale. The dotted green line represents a 2% trend, which has been remarkably durable. For the past 13 years ex-energy inflation has averaged almost exactly 2% per year, and there is every reason to think this will continue for the next year. Seven years of near-zero interest rates did not "stimulate" inflation (nor the economy in general, I might add), so why should a modest increase in interest rates depress inflation, much less create deflationary conditions? The deflation threat is a myth, and since the risk of deflation is nonexistent there is no reason for the Fed to postpone liftoff. 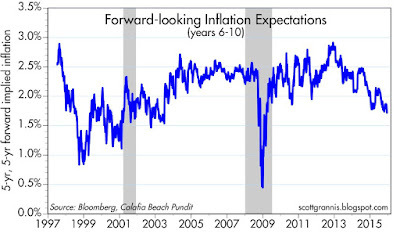 Now let's look at the market's current inflation expectations, as embedded in the pricing of TIPS and Treasuries. 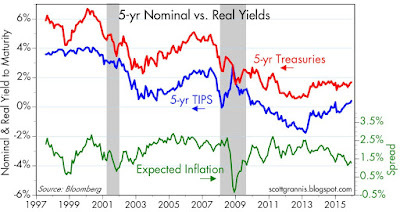 The chart above shows the nominal yield on 5-yr Treasuries, the real yield on 5-yr TIPS, and the difference between the two, which is the market's expectation for the annualized rate of CPI inflation over the next 5 years. 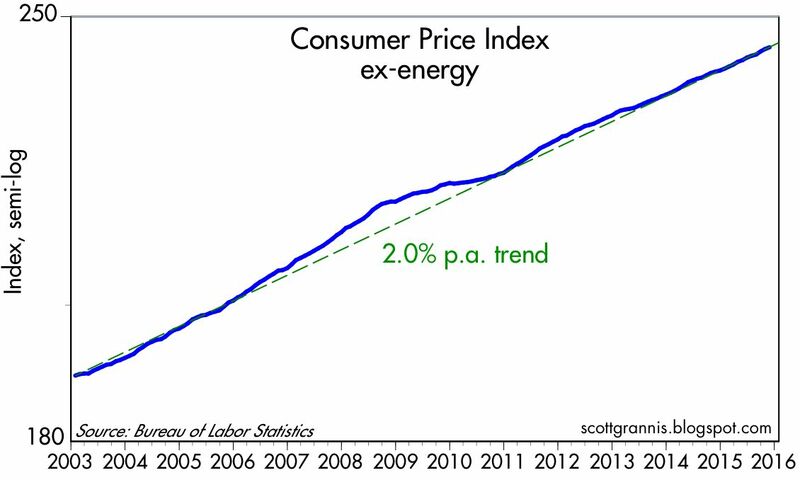 Currently about 1.25%, it is significantly less than the prevailing rate of ex-energy CPI inflation. Either the market is correctly anticipating more and substantial declines in energy prices, or it is seriously underestimating future inflation. For example, if inflation were to average zero for the next two years (e.g., because of further declines in energy prices), and then rebound to 2.0% for the subsequent three years, the annualized rate of inflation over the next 5 years would be 1.2%. This scenario is pretty close to what the market is apparently assuming will happen. The chart above shows the market's forward-looking inflation expectations (technically speaking, the 5-yr, 5-yr forward inflation expectation). This represents the market's expectation for the annualized rate of CPI inflation in years 6-10. Currently 1.8%, it is only marginally less than the underlying rate of ex-energy inflation. Over a multiple-year period, then, the market expects inflation to rebound to what it has been over the past 13 years. If the market is making a mistake, it is in expecting the underlying rate of inflation to remain unusually low for the next few years, before rebounding within 5 years or so to the same 2% level we have seen over the past decade. The surprise, in other words, would be for inflation to end up closer to 2% than to zero over the next few years. An inflation surprise next year might well unsettle markets, since today's benign expectations assume that the Fed will be very slow in raising interest rates. But at the same time, an upside inflation surprise would put a dagger through the heart of the market's continuing worries over deflation, and how deflation might (supposedly) act to slow the economy's growth rate. It's tough to know how this would all play out next year. But if inflation does surprise on the upside, then the Fed's decision to raise rates this week will prove completely justified, if not too little, too late. The Fed has every reason to raise rates by 25 bps at this week's FOMC meeting. 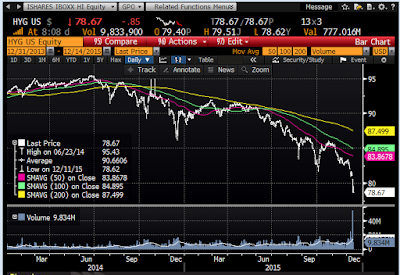 Markets are once again in a tizzy over junk bonds, mainly of the oil variety. The situation in the oil patch is pretty dicey, no doubt about it, but aside from that it's hard to find much genuine distress. 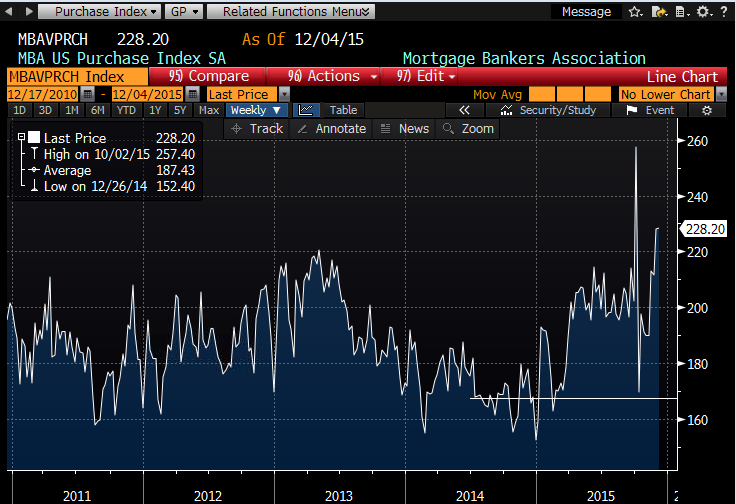 Lots of panic selling in a few areas, but no systemic distress. From the looks of key indicators, this is not a replay of 2008. 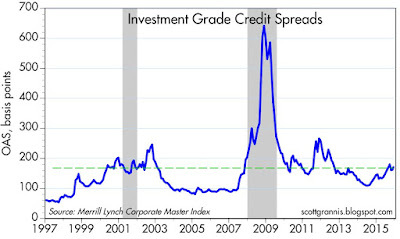 The chart above shows investment grade credit spreads as measured by the Merrill Lynch Corporate Master Index, as of Dec. 11th. 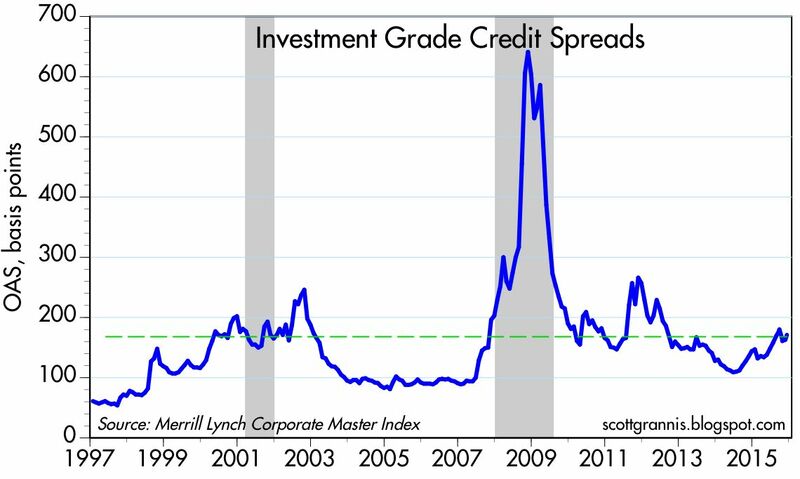 Spreads are somewhat elevated, to be sure, but they are not even close to the distressed conditions we saw in late 2008. They are about the same today as they were before and during the 2001 recession, which was the mildest on record. 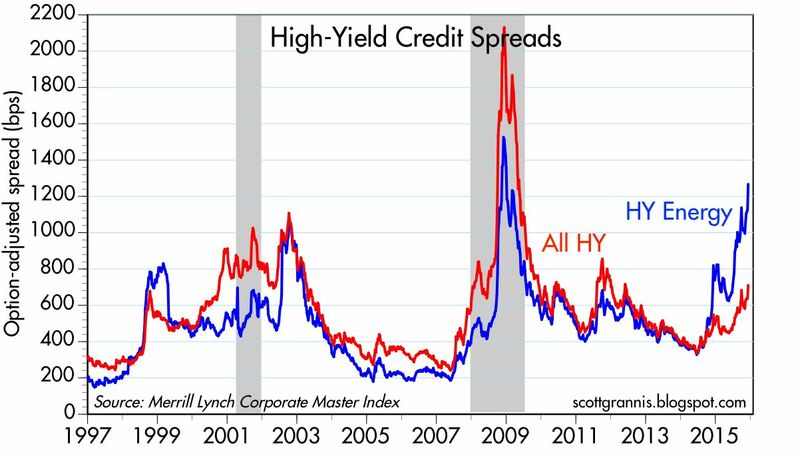 High-yield credit spreads are significantly higher than investment grade spreads, but the difference between HY and IG spreads (shown in the second chart above) is still significantly shy of what we have seen during genuine periods of economic and financial distress. 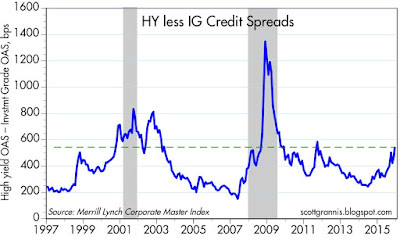 Once we drill down to the energy sector of the HY market, however, we see the main source of today's market angst. The market value of HY energy bonds has dropped fully 30% from the highs of mid-2015, which was just before oil prices started to collapse. Crude oil futures are now down to $35 per barrel or so, which is a long way from the $110+ prices which prevailed during the first half of last year. 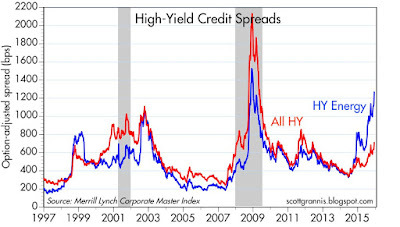 Here are some relevant statistics: Energy-related HY corporate bonds represent about 15% of the HY debt market, but the losses in this segment represent about half the losses of the entire HY market. 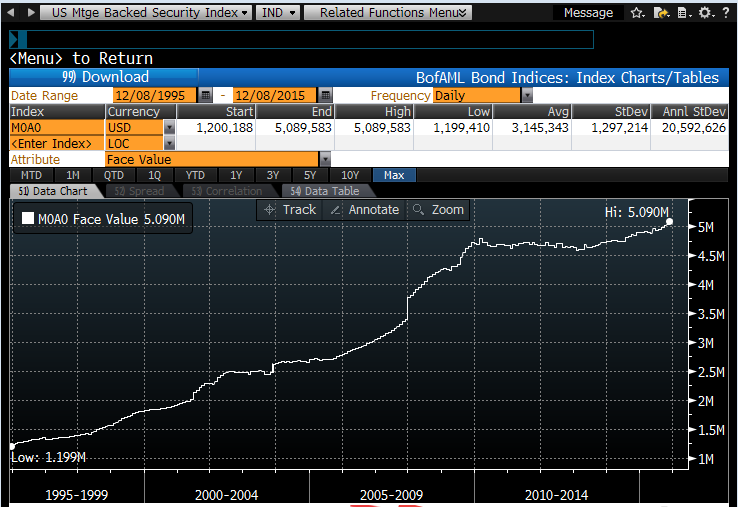 That implies that losses on non-oil HY bonds are only about 6%. The chart above shows the price of HYG, which is an ETF that targets the liquid bonds in the iBoxx HY Index. Note the massive increase in trade activity last week, when more than 54 million shares traded hands on Friday, as compared to 10 million or so daily during a normal week. 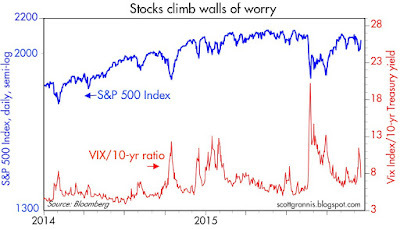 This has all the earmarks of the panic selling described in a recent WJS article. Investors trying to escape the damage in the oil patch have triggered a wave of selling that has affected the entire HY sector. But there's one thing missing from the "panic" story. 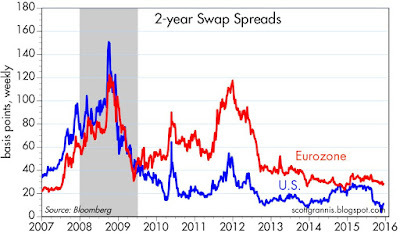 Swap spreads, shown in the chart above, are not displaying any signs of distress, either here or in the Eurozone. 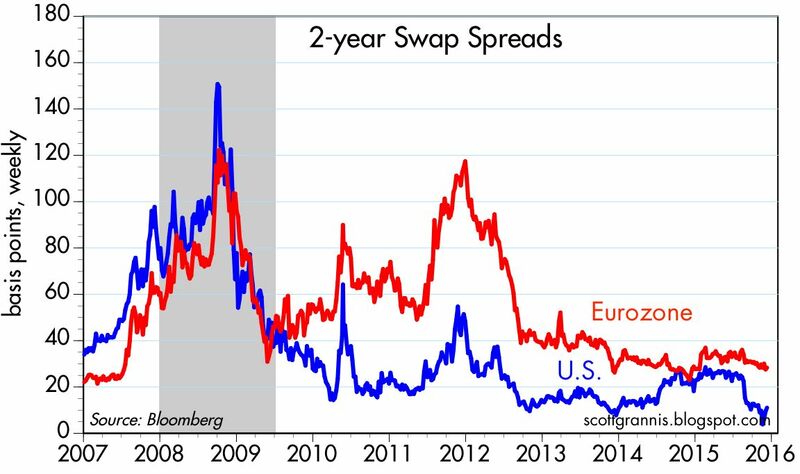 Swap spreads are relatively low and stable, which means that liquidity conditions in the financial markets are normal. Large institutional investors can buy and sell risk easily, and in quantity, without having to pay high prices to do so. 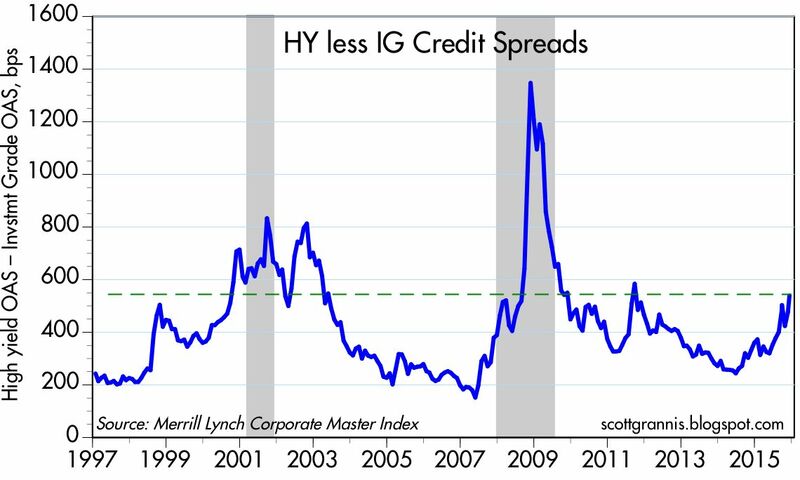 Swap spreads say that systemic risk is low, which is another way of saying that the distress in the HY market and in particular in the oil patch has not proved contagious to the larger economy. This is very different from the situation in 2008, when the distress in the housing and in particular the MBS market did prove contagious—and highly so. 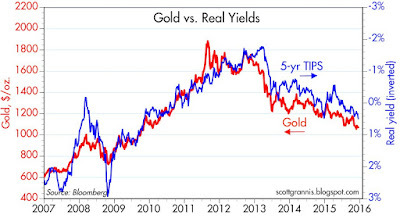 Systemic risk also fails to appear in the prices of gold and 5-yr TIPS, as the chart above shows. The prices of both of these safe-haven assets have been on a declining trend for several years. If things were really falling apart, the two lines in this chart would be headed skywards. But they're not. Collapsing oil prices have already resulted in a two-thirds decline in the number of active oil drilling rigs in the U.S., so we know that the current glut of oil supply is on its way to reversing, and in time oil prices will firm. Lots of money has been and will be lost in the oil patch, but even today the losses that have been registered in oil-related energy debt are quite small, on the order of $60-65 billion. That's a drop in the bucket of U.S. asset markets, and a very tiny fraction of the $80 trillion of net worth that resides in the U.S. This is not a time to panic, it's a time to find value outside the oil patch. 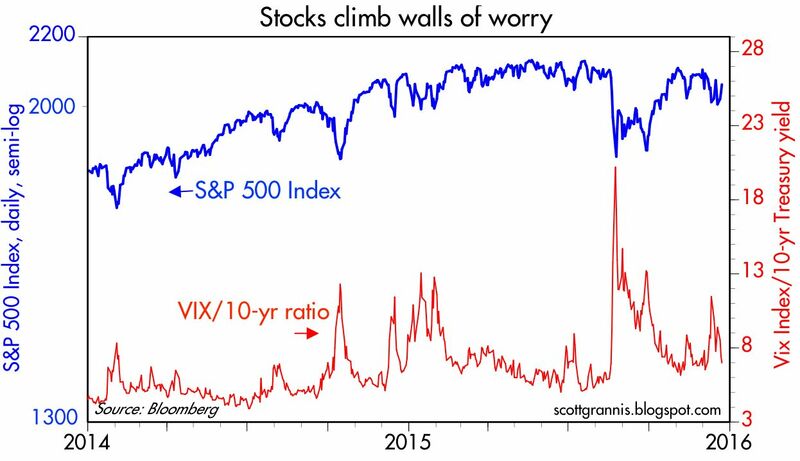 It's one more "wall of worry" that we're likely to leave behind. We're seeing important stirrings of life in a market that has experienced little or no growth for the past six years. 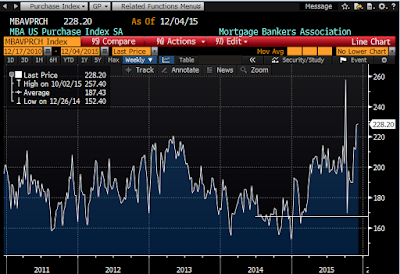 As the chart above shows, new applications for mortgages (not including refinancing applications) last week and the week before were up over 35% relative to their average in the second half of last year. If we ignore the one-time jump in applications in late September—which was an artifact of major changes to banks' reporting requirements—mortgage applications last week were higher than at any time since mid-2010. As the chart above shows, the total amount of mortgage debt outstanding in the U.S. has been declining since 2008, but looks to have bottomed. (This chart only covers data through June '15.) Outstanding mortgage debt today totals some $9.5 trillion, and has not grown at all for the past 9 years. 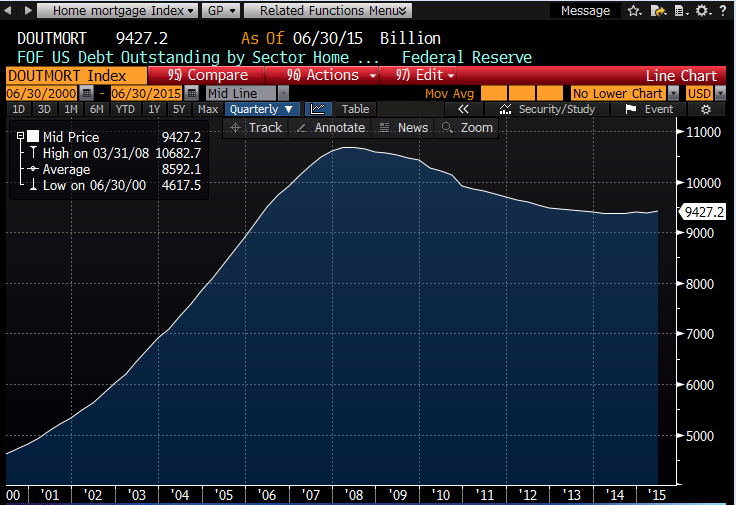 The chart above shows the total amount of mortgages that have been securitized, roughly $5.1 trillion. After about four years of zero growth, from late 2009 to late 2013, securitized mortgages have increased by almost 10% in the past two years. I think it's safe to conclude that the demand for mortgage loans is once again on the rise after many years of weakness, and the financial markets have accommodated that demand by lending more. Homeowners are now more willing to borrow, and lenders are more willing to lend. 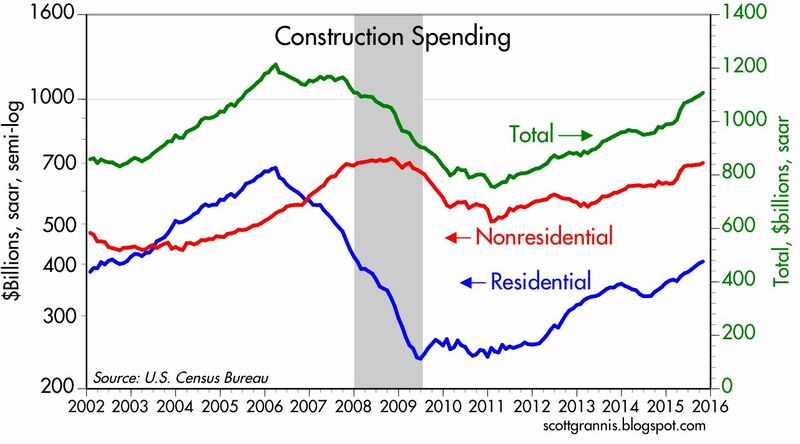 As the chart above shows, residential construction spending has increased 17% in the year ended last October. Builders are responding to the rising demand for homes (nationwide prices are up about 30% in the past four years, according to Case-Shiller) and the rising demand for new mortgages. Housing starts have been rising for the past five years, and show no sign of slowing. Builders are building more because homes are selling. 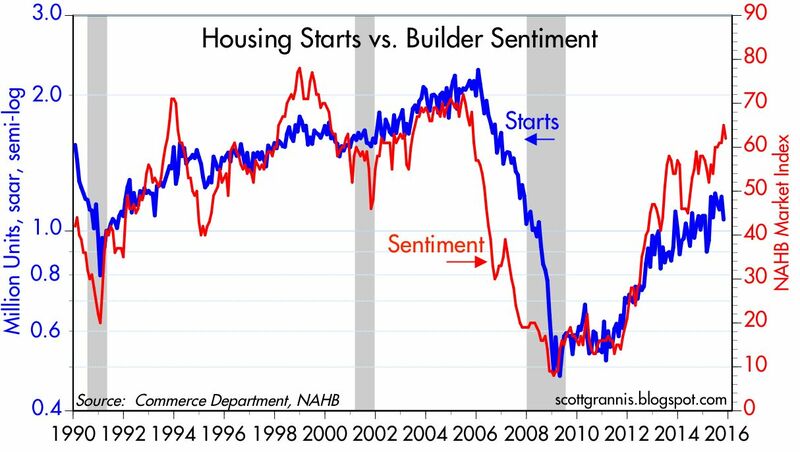 It's quite likely that housing starts continue to rise for the foreseeable future, given ongoing growth in new home formations and the need to catch up for years of very weak construction activity. 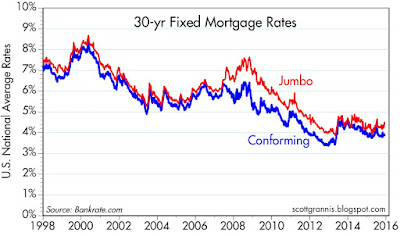 10-yr Treasury yields are the major determinant of mortgage rates, and both bottomed in late 2012. We may now be living through the early stages of a reversal of the declining trend long-term interest rates which began in 1981. 30-yr fixed rate conforming mortgages are now going for 3.84%, up almost half a point from their all-time low at the end of 2012. Strong loan demand may in part be fueled by a "get it now before rates go higher" mentality, but it may also be fueled by increased confidence and prosperity on the part of homebuyers. Plus, there are almost 5 million more jobs in the economy today than there were when the housing market last peaked. It's no secret that markets are worried about slow growth in China, collapsing oil prices, generally weak commodity prices, and the impending "lift-off" of short-term interest rates about to be engineered by the Fed. 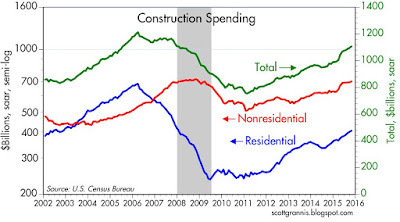 However, the budding strength of mortgage loan demand and the ongoing rise in construction activity in both the residential and nonresidential markets constitute a substantial and arguably overlooked counterweight to the weakness in other areas of the economy. Expect economic growth to continue in the 2 - 2 1/2% range we've seen for the past several years. 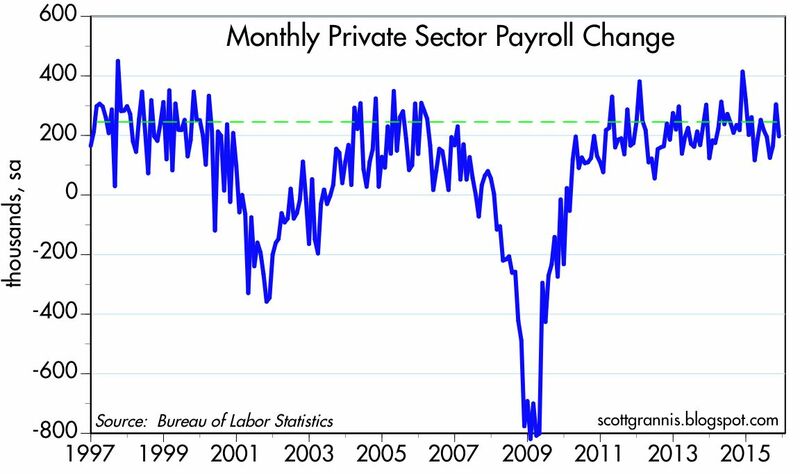 The November jobs number was marginally better than expected, and with upward revisions to prior months it adds up to ... pretty much the same kind of growth we've seen in recent years. There's nothing to get excited about—unless, that is, you were worried that the economy was slowing down and at risk of deterioration given that the Fed is almost sure to begin raising short-term interest rates in 12 days. 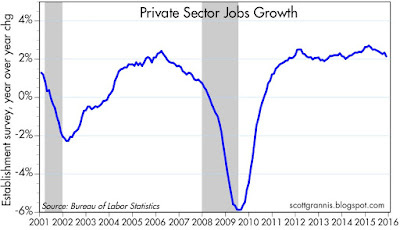 The charts above show the monthly change and the year over year rate of growth of private sector jobs. Jobs have been growing at slightly more than 2% a year for a number of years. 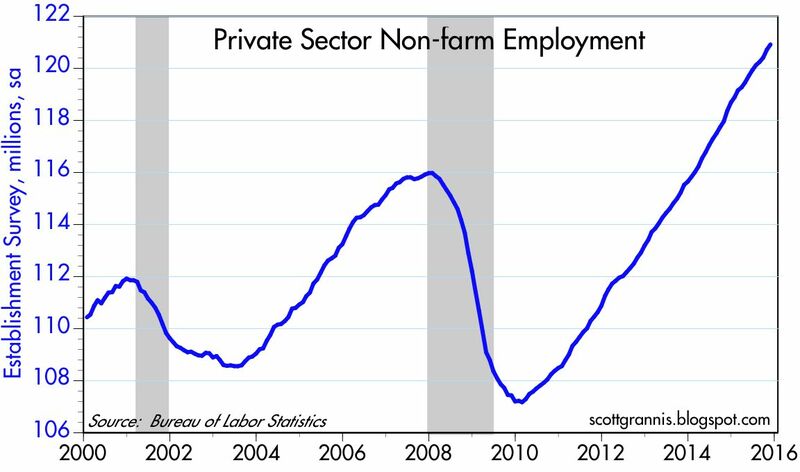 We're still mired in the "weakest recovery ever," given that real GDP is about $2.6 trillion below its long-term trend, but as the chart above shows, the private sector has created a lot more jobs in the current business cycle expansion than it did in the prior one. The net gain in jobs since late 2007 is now 5 million, which tops the 4 million rise in jobs from late 2000 through late 2007. 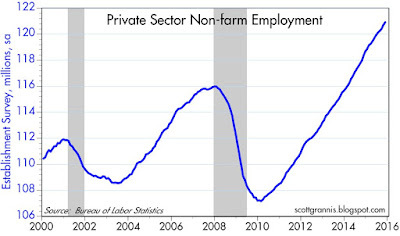 From the low in early 2010, the private sector has actually created about 14 million jobs. That's not so bad, and it at least makes you question why so many continue to moan and grown about how terrible the economy is. Sure, we could and should be doing a lot better, but there is no denying that we have made considerable progress despite all the headwinds (e.g., high tax burdens, huge new regulatory burdens). If there is one important point here, it is that this is NOT a fragile economy. It's an economy that has been growing at a slow but relatively steady pace for over six years, and there is no sign yet of any deterioration. When the Fed raises the interest it pays on excess reserves later this month to 0.25%, the impact on the economy is going to be de minimis. In fact, it might even be positive, if for no other reason than markets might become a little more optimistic about the future now that the Fed is demonstrably less worried. As the chart above shows, the price of 5-yr TIPS (using the inverse of their real yield as a proxy for price) and the price of gold have been slowly declining for some 3 years. It take that as a sign of declining pessimism, since both these assets have unique qualities that make them "safe" investments. 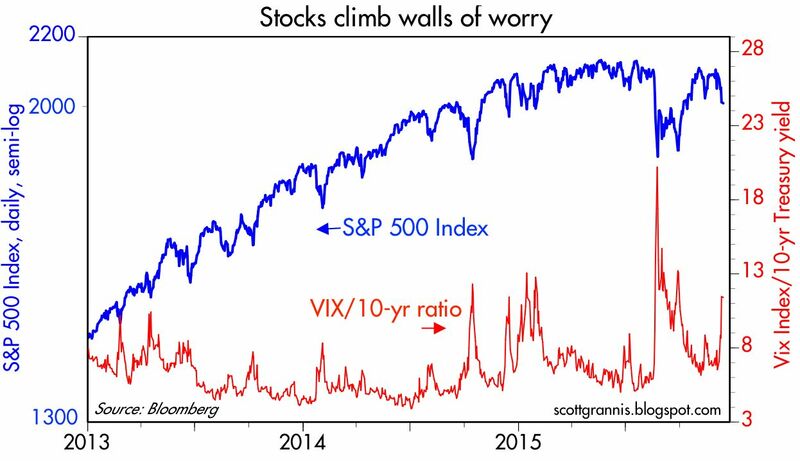 This tells us that markets are slowly losing the fears that built up in the wake of the Great Recession and the PIIGS crisis. 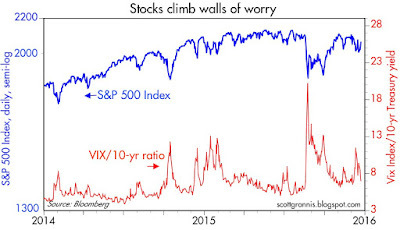 As the chart above shows, the equity market has been periodically upset by flare-ups in "worry," for which I use the ratio of the Vix index to the 10-yr Treasury yield as a proxy. 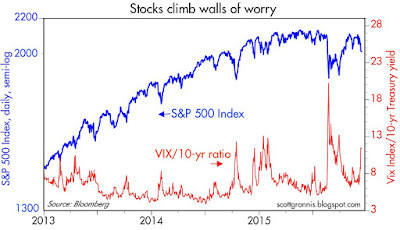 The market gets very nervous from time to time, but then worries subside and equity prices rise. It's hard to get real worried when the economy demonstrates, as it has over the years, an ability to overcome adversity and just keep on chuggin' along, albeit slowly. 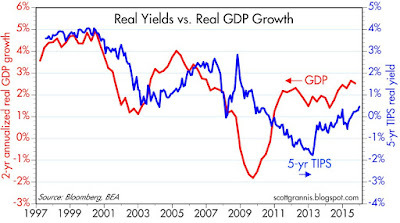 As I've been saying for years, avoiding recession is all that matters when short-term interest rates are near zero. 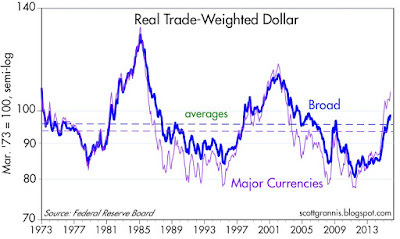 This chart is arguably the best way to look at the relative strength or weakness of the dollar. It's calculated by the Fed, and adjusted for trade weights and inflation. There are two versions: one using a broad basket of currencies, and the other using just seven major currencies (euro, Can$, yen, pound, swiss franc, aussie$, and swedish krona). 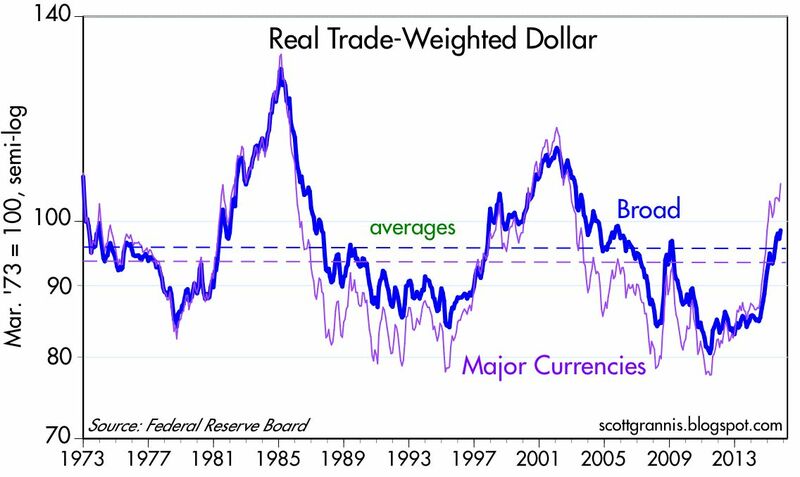 The most recent data, released today, shows that the dollar is trading about 2-12% above its long-term average values against these baskets of currencies. I've used a log scale for the y-axis in order to better reflect the degree to which the dollar is above or below its long-term average. 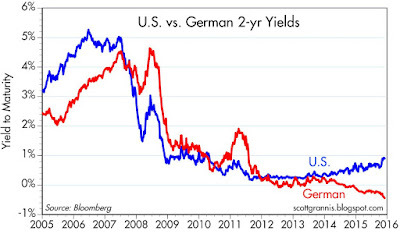 The chart above compares 2-yr Treasury yields with 2-yr German yields. They have diverging for almost two years now, driven by the growing perception that the Fed would raise rates sooner than the ECB, and more recently, by the ECB's professed willingness to actively pursue easier monetary policy for the foreseeable future. The chart above makes it clear that interest rate differentials between the U.S. and the Eurozone (blue line) go hand in hand with changes in the Euro/dollar exchange rate (red line). 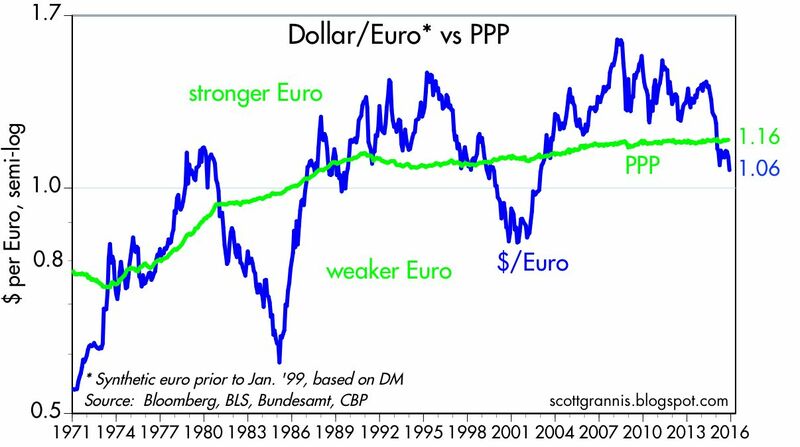 The dollar has strengthened vis a vis the Euro in line with more attractive U.S. interest rates. The chart above compares the dollar value of the Euro against my calculation of the dollar's Purchasing Power Parity against the Euro (green line), which can be thought of as the exchange rate that would result in prices in the Eurozone being generally comparable to prices in the U.S. By my calculations, the dollar is almost 10% above its PPP value against the Euro, which means that U.S. tourists to the Eurozone should find that things are a bit cheaper there. It's nice to have a strong dollar, and it's not strong enough at current levels to worry about. We're now two weeks away from the December FOMC meeting, when it is widely expected—and feared—that the Fed will lift short-term interest rates for the first time since mid-2004. It's not yet a slam dunk, given today's weak ISM manufacturing report, but market pricing implies a 70% probability of a move, and short-term rates are already rising in anticipation. The bond market is doing its best to give the Fed the "all clear," and the stock market looks to be in agreement. This is great news. 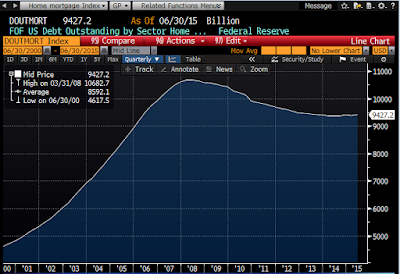 The two charts above put the Fed's upcoming move into historical context. The decline in interest rates which began 34 years ago is now coming to an end. 2-yr Treasury yields, which are equivalent to the market's expectation for the average Federal funds rate over the next two years, are now 0.9%, up from an all-time low of 0.16% in September 2011. They haven't been this high for over 5 years. 10-yr Treasury yields are now 2.15%, up some 75 bps from their all-time low of 1.39% in July 2012. 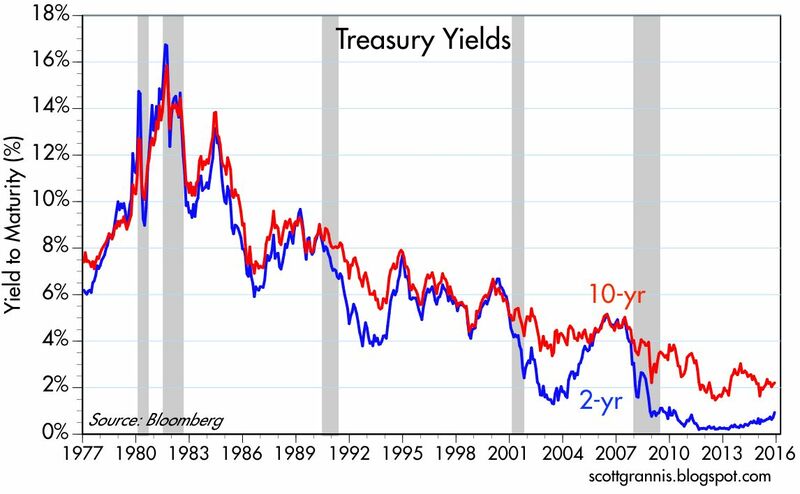 There's nothing unusual or scary about the current slope of the yield curve; it simply means that the market fully expects higher rates, but not so high as to threaten growth. 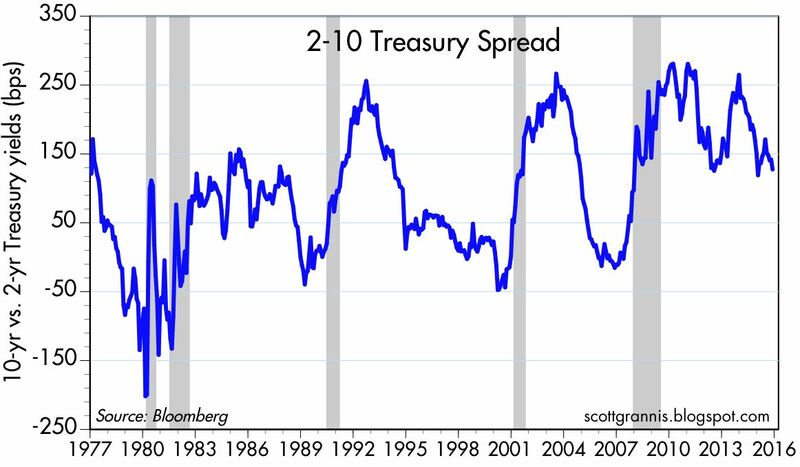 The time to worry is when the yield curve becomes flat or negative, and we are probably years away from that. No one expects the Fed's upcoming or subsequent moves to threaten anything. 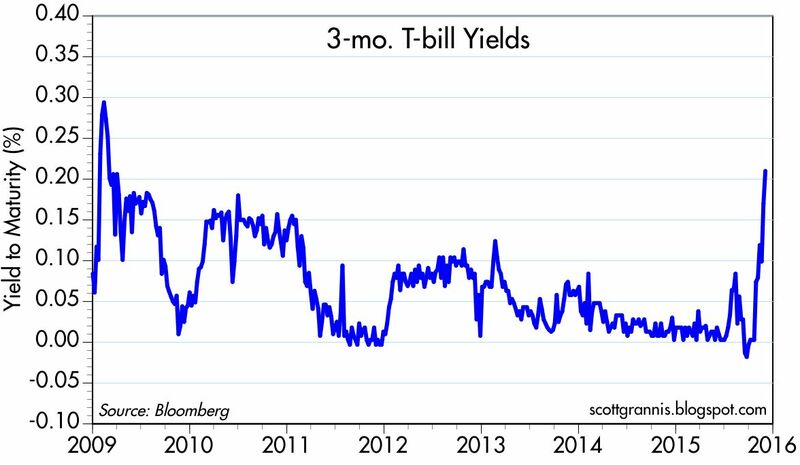 As the chart above shows, 3-mo T-bill yields have jumped some 20 bps in the past six weeks, after hugging zero for several years. Market participants are no doubt deciding that the yields available on alternatives—such as bank reserves and 3-mo LIBOR—are more attractive than earning nothing on bills: swapping out of bills into the alternatives is the logical maneuver. It's encouraging to see the price of the world's premier safe asset fall, since that suggests that the economic and financial market fundamentals have improved on the margin. 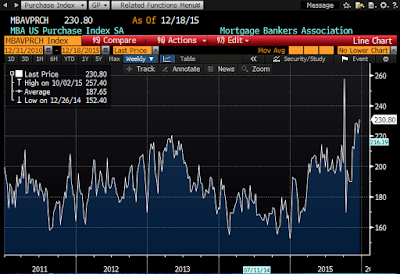 Expect to see money market rates in general moving higher. Finally. 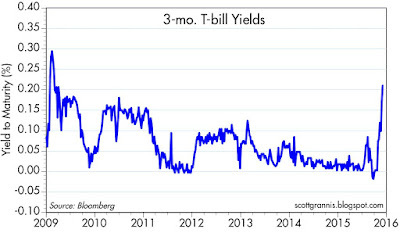 It's also encouraging to see that the recent rise in T-bill yields has been associated with a decline in the TED spread (the difference between the yield on 3-mo LIBOR and 3-mo T-bills). 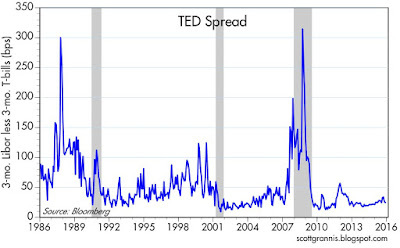 This spread has always been a good indicator of financial market stress. 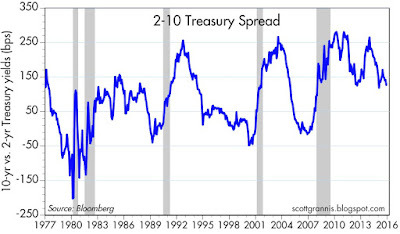 The current spread, about 20 bps, is almost exactly at the level you would expect to see during periods of normalcy. 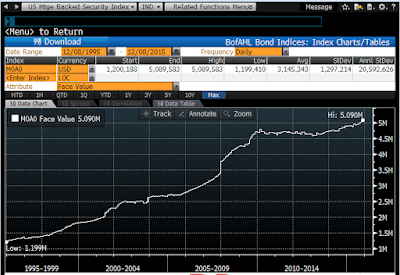 It's narrowed mainly because LIBOR yields have risen less the T-bill yields. As such, it reflects the dynamic of rising interest rate expectations, and not any deterioration of the fundamentals.